Home Blog Pet Health Why Is My Dog’s Poop White? Why Is My Dog’s Poop White? More than just an inconvenience that you have to pick up from your yard or on walks, your dog’s poop is actually a very tell-tale sign of his health. Just like humans, healthy bowel movements are crucial for your dog’s health and when something isn’t quite right, your pup’s poop will tell you! There are many different types of dog poop, from green to white to (hopefully not) bloody. These are all signs that something is not right with your fluffy friend. If you notice anything major different about your dog’s poop or his behavior, contact your vet immediately. This article will help you understand why your dog’s poop might be white. The issues may stem from his diet, an internal upset, or something wrong that he ate. It also examines what may cause grey or clay-colored poop (often confused for white poop), look at what consists of healthy poop, different colors of dog poop and a short reason for each, and some things that may cause your dog’s poop to be abnormal, including diet changes and stress. Everybody poops, so let’s look at what white poop means and what to do if your dog has white poop. This is a question many dog-owners find themselves asking and there’s no question why. When you notice your dog’s feces are a bright, white color rather than a healthy brown, it sparks reason for concern. Interestingly, white dog poop happens over time as the poop disintegrates and dries out, so you might not see your dog’s white poop right away, but hours later. Luckily, though, white poop usually stems from something that can be easily corrected. The most common reason for a dog’s poop to be white is too much calcium in their diet. Imagine drinking a lot of milk, or the natural color of bones (both sources of calcium). White, right? When dogs have too much calcium in their diet, it can cause their poop to match. Calcium-rich diets are generally associated with raw dog food diets because these raw diets are made with whole parts of animals, including the bones. While normally healthy for dogs, too much of this mineral can lead to problems. Opt for a raw food diet that has fewer bones and calcium. If you make your raw food at home, make it with less bone than you normally do. If you buy a consumer-brand raw diet, look at the ingredients and calcium levels. Choose one that has a lower concentration of calcium. 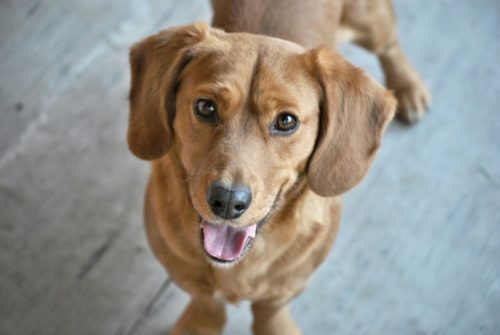 Add a bit of pumpkin to your dog’s diet, as it is a natural way to kickstart his digestion. Some vets recommend adding one teaspoon of pumpkin per 10 pounds of weight. your pup if he is unable to expel the waste that he needs to. If you notice your dog getting constipated, try adding pumpkin to his diet as mentioned above or bran, both of which have lots of fiber. But don’t overdo it! Too much fiber and you might find yourself having the opposite problem. Meanwhile, most dry kibbles consist of corn, gluten meal, and animal bi-products. Without suggesting one or the other because every dog’s health is different, many veterinarians and animal dieticians recommend raw or wet food diets because it more closely matches what a dog would eat in the wild. While raw diets may cause your dog’s poop to turn white, this can easily be adjusted and you can still see the benefits of a raw diet. Another reason why your dog’s poop is white might be that he ate something he wasn’t supposed to! 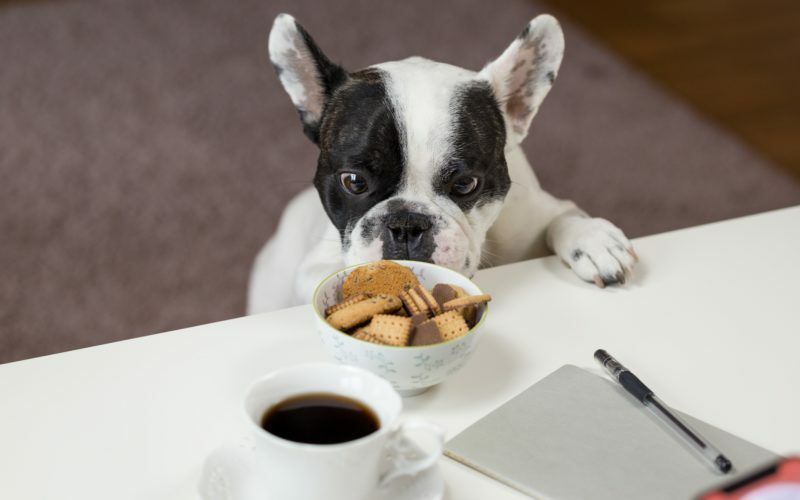 Dogs are notorious munchers, so keep your eye on what your pup ingests. It could be toilet paper, paper towels, trash off the ground, or anything white that is impacting your dog’s poop. If this is the case, luckily it will pass (literally) and you know to keep a close eye on what he is eating. Keep lids on all the trash cans, close the bathroom door if your dog likes to get into the toilet paper, and puppy-proof your house. What Should I Do if My Dog’s Poop is White? As discussed earlier, white poop may be indicative of a calcium-rich diet, which is easily fixable. If you are feeding your dog a raw diet, simply limit the amount of calcium he is getting. If he is eating kibble, make sure he isn’t getting too much calcium from other sources. While it’s important to explain why your dog’s poop is white, it’s also important to look at grey stools, because they can mistakenly be identified as white poop. Unfortunately, grey poop might be the sign of a more serious underlying problem than too much calcium or your dog eating something he’s not supposed to. Clay-colored poop can indicate liver or pancreas disorders. Why is My Dog’s Poop Light Grey? Liver disorders that cause a lack of enzymes or bile production, which helps turn healthy poop brown, can lead to grayish-white stools, a lack of appetite, weight loss, jaundice, and many other symptoms. These are just a few signs the liver isn’t functioning normally. If you believe this is the case, take your dog to the vet immediately so a vet can diagnose the problem. Most vets will determine liver problems through a blood chemistry panel, complete blood count and bile acid test among others. Treatment for liver problems in your pup will depend on the severity of the case. Sometimes, it may be as simple as a change in diet, but your vet will know more accurately the best course of action. 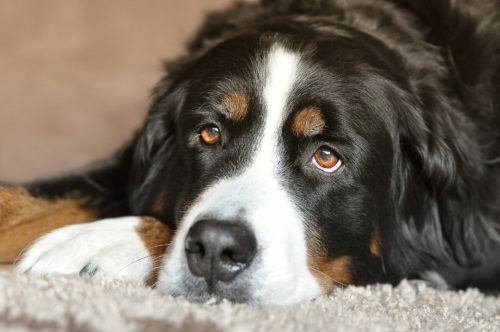 Bile is one of the components responsible for making your dog’s poop brown and healthy, so when a bile duct is obstructed, you may notice grey or white poop. This blockage, called bile duct obstruction, can be treated with surgery, medication, or a change in diet. If your dog’s poop is clay-colored, he may be suffering from Exocrine pancreatic insufficiency. This is a condition where the pancreas doesn’t produce enough digestive enzymes. 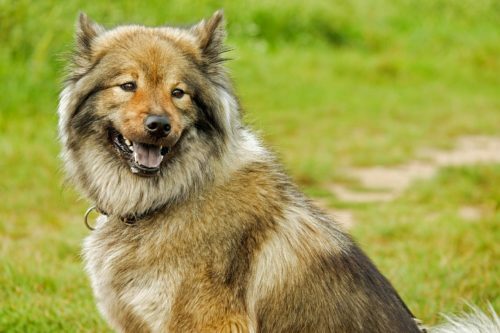 Without these enzymes, your dog’s poop may become clay-colored or light grey. This ailment is typically treated with medication and a change in diet. After explaining all about white or grey poop, you should also know what healthy dog poop looks like so you know what to expect. Color – Healthy dog poop is a rich, chocolate brown. If you feed your dog food with any added colors, these might show up in his stools, as well. Shape – Most dog poop should look like logs, in long pieces. If your dog’s poop is runny, he may have diarrhea. If it is small pellets, he may be dehydrated. Smell – There’s no denying it: dog poop stinks! But, it shouldn’t be overly stinky or smell like nothing (wouldn’t that be nice?). The smell of poop means your dog’s digestion system is doing its job. Consistency – It should be easy to pick up your dog’s poop, but it should still be a little squishy (like dough) in your hand. Amount – The amount your dog poops should correspond with how much he eats. Too much poop might mean that he has too much fiber in his diet, while not enough poop might be a sign that he’s constipated. Contents – Your dog’s poop should be made up of what he last ate. If you notice mucus, parasites, or anything else abnormal in your dog poop contents, talk to your vet immediately. This is likely a sign of an underlying health issue. Green poop, which most likely stems from your dog eating too much grass, or having diarrhea. Black poop, or tar-like poop, which may be a sign of a gastrointestinal or stomach ulcer. Red or bloody poop, which may be a sign of bleeding in your dog’s gastrointestinal tract. Yellow dog poop, which, when it contains yellow mucus, usually indicates a food intolerance. Examine the ingredients of your dog’s food to make sure he isn’t intolerant. White specks in your dog’s poop, which could be worms. Most worms are treatable, contact your vet for more detailed care. His diet – Often times, dogs will get constipated or have diarrhea after a diet change. If you’re going to change your dog’s diet, do so slowly and wean him off of his current food first. Any abrupt changes might throw him off. Stress – When dogs are stressed, whether it’s because of a lifestyle change, new companion in the house, or another reason, they may experience different bowel movements and kinds of poop. Luckily, this will usually sort itself out but if not, remove the source of stress and take your pup to the vet. Internal issues – This one is the most serious and likely when you won’t see your dog’s poop resolving itself quickly. If you notice abnormal stools, like the white poop and grey poop mentioned earlier, for prolonged periods of time, take your dog to the vet. Grey or chalk-colored poop might be caused by liver or pancreas problems. Your dog’s poop should have a consistent color (brown) and texture (firm but squishy). It should only be made up of digested food (not mucus or parasites), should be shaped like a log, and should correspond to the amount he last ate. And it should be stinky (but not too much so)! Poop is more than just something that you step on with your new shoes (we’ve all been there!). It’s color, consistency, amount, and contents can all be signs of a healthy dog or a problem to identify. One of these odd colors, white, is likely caused by calcium-rich diets or because your pup ate something he wasn’t supposed to, like paper or trash. Naviglia, Nocole. What Does Dog Poop Color Mean? CanineJournal, 7 June 2017, Accessed 19 Dec. 2017. www.caninejournal.com/dog-poop-color/. Taylor, Marygrace. “6 Things Your Dog’s Poop Can Tell You About Its Health.” Good Housekeeping, 12 July 2018, Accessed 19 Dec. 2017. www.goodhousekeeping.com/life/pets/a20706878/healthy-dog-poop/. “The Scoop in the Poop: Your Dog’s Health Secrets Revealed.” Cesar’s Way, 23 May 2017, Accessed 19 Dec. 2017. www.cesarsway.com/dog-care/diagnosing-a-dog/The-scoop-in-the-poop. “Assessing Your Dog’s Poop for Signs of Health Problem.” Healthy Pets, Accessed 19 Dec. 2017. www.healthypets.mercola.com/sites/healthypets/archive/2015/07/15/assessing-dog-poop.aspx. Donovan, Liz. “What Your Dog’s Poop Says About His Health.” American Kennel Club, 7 Aug. 2015, Accessed 19 Dec. 2017. www.akc.org/expert-advice/health/dogs-poop-says-health/.